I was extremely busy for the past two weeks and I simply did not have any time to write the weekly post. But without any more delays, as promised, here is the argument against Bohmian interpretation. The argument comes from a famous paper by Englert, Scully, Süssmann, and Walther: Surrealistic Bohm Trajectories. For clarity, here are the original paper, the rebuttal, and the response. 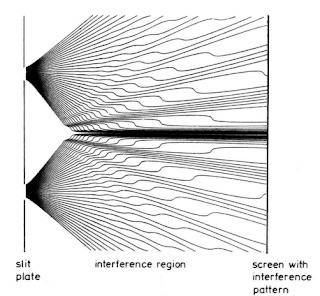 The argument is simple: in a double slit experiment with a which way detector present before the slit (which incidentally kills the interference pattern), the Bohmian trajectories do not cross the axis of symmetry. and \(\psi_>\) does not vanish in the bottom part and \(\psi_<\) does not vanish in the top part. As such, the particle can be found in the down section while the particle was detected earlier by the upper which way detector. But this is at odds with Bohmian trajectories which by symmetry considerations do not connect the up with the down. The conclusion is that Bohmian trajectories do not always have a correspondence in reality. The issue is not whether Bohmian quantum mechanics does or does not make the same prediction as standard quantum mechanics as the rebuttal seems to imply, but the issue is the ontology of Bohmian trajectories. The claimed advantage of Bohmian mechanics is its clarity rooted in realism, but if Bohmian trajectories are at odds with experiments, what is the value of Bohmian interpretation? Remember that in Bohmian interpretation the only thing "real" is the particle trajectory. I could not find a valid answer from the Bohmian community to the surrealistic paper challenge and in my opinion this paper it is a decisive clear cut argument against Bohmian interpretation. 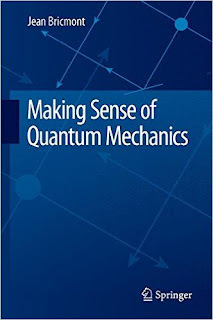 Book Review: "Making Sense of Quantum Mechanics"
After much delay I had found the time to finish reading Jean Bricmont's "Making Sense of Quantum Mechanics" book. The book is the best presentation of Bohmian interpretation I have ever read. It masterly combines the philosophical ideas with a bit of math, famous quotes, and some historical perspective. After preliminary topics in chapter one, chapter two discusses the first quantum "mystery": superposition, while chapter four discuses the second "mystery": nonlocality. It was chapter three, a philosophical "intermetzzo" which took me a very loooong time to read and prevented me to write this review much sooner: one one end I could not write this post without reading it, and on the other end I was loosing interest very quickly in it after a couple of pages of historical review. Then Bricmont proceeds into presenting Bohniam mechanics - the heart of the book. "the conclusion of his [Bell's] argument, combined with the EPR argument is rather that there are nonlocal physical effects (and not just correlations between events) in Nature." To support this chapter 4.2 discusses "Einstein's boxes" [I had a series of posts discussing why in my opinion they do not represent an argument for nonlocality. What EPR+Bell shows is that the composition of two physical systems into a larger physical system does not respect the rules of classical physics - parabolic composability but new rules - elliptic composability. Nature is not "nonlocal" but "non-parabolic composable"]. Onto the main topic, the presentation of Bohmian mechanics is standard and what it is surprising is the degree on which the underdetermination issue is addressed: there are an infinite number of alternative theories (like Nelson's stochastic theory) which are in the same realistic vein and which make the same predictions as Bohmian mechanics. Chapter three discussion is invoked here but I feel the argument is very weak (not even a handwaving). Then the book talks about alternative approaches to Bohmian mechanics courageously taking (some well deserved some not) shots at alternative interpretations (like GRW, MWI, CH, Qbism), and wraps up with historical topics and sociological arguments. Now onto what the book covers poorly: surreal trajectories, and quantum field theory in Bohmian mechanics. Surreal trajectories are mentioned in passing in a quote while they are the major objection to the interpretation. As I said before, the very name "surreal trajectory" was a masterful catchy clever title for a paper but it backfired in the long term because it was attaching a stigma to Bohmian mechanics which in turned allowed Bohmian supporters to summarily and unfairly dismiss the argument. I will revisit the argument in next post. The key point of surreal trajectories paper is that the particle is detected where Bohmian mechanics predicts it must not go, and since the only thing "real" in Bohmian mechanics is the position of the particle, it represents a fatal blow to the Bohmian ontology. Currently, to my knowledge, there is no consensus inside the Bohmian community on the proper answer the surreal trajectory paper: some deny it is a problem at all while others acknowledge the problem and propose (faulty) ideas on how to deal with it. This is similar with the situation inside the MWI camp where the big pink elephant in the room there is the notion of probabilities: some in MWI disagree it is an issue while others attempt to solve it (but fail). Quantum field theory in Bohmian mechanics is another sore point which is not properly discussed. My take on the topic is that a Bohmian quantum field theory is impossible to be constructed, and I want to be proven wrong by a consistent proposal: show me the money, show me the archive paper where the problem is comprehensibly solved. Bad points aside, overall I liked the book, I find it stimulating, and I enjoyed very much reading it (except chapter 3 which invariably succeeded putting me to sleep). 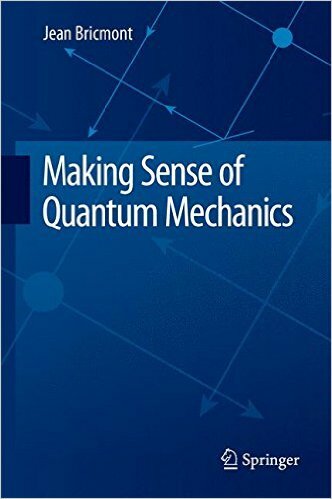 The book is a must read for any person seriously interested in the foundations of quantum mechanics. "I would like to understand whether the equations (67) - (75) in Joy Christian’s paper “Local Causality in a Friedmann-Robertson-Walker Spacetime” make any sense at all. I don't understand how the mathematical limes operation are carried out." The main hand-waving trick in the "derivation" is a conversion inside of a sum of \(\lambda^k\) from a variable into an index which amounts to adding apples to oranges and obtaining the incorrect result (see the bottom of page 8 on my preprint: https://arxiv.org/pdf/1109.0535v3.pdf). The preparation for this trick is on Eq. 49 which encodes the two distinct algebras (of apples and oranges) into a common formula. In my preprint you can double check this by trying out the matrix representations of the two algebras (eqs 53-56). Hopefully my explanation is clear enough. I know all Joy's mathematical tricks in all of his papers or in his blog debates, but I ran out of energy debunking his nonsense. Kudos to Richard Gill for pursuing this further. I was aware of the "Causality in a Friedmann-Robertson-Walker Spacetime" paper and it was on my to do list to write a rebuttal to it, but the journal withdrew it before I could get to it.